The decisions we make and the actions we take are guided by our values of Honour, Enterprise, Unity and Commitment. This is also expressed in how we care for the professional and personal development of our colleagues across the organisation. We are dedicated to building a culture where our colleagues are empowered to make a positive and meaningful difference in what they do for our internal and external stakeholders. We do this by fostering an inclusive, prudent, progressive and high-performing organisation that encourages the best of each individual from our team of principled professionals. We are committed to developing among our colleagues a sense of belonging to UOB. Our values give us a shared sense of identity and belonging, and our four employee commitments encourage us to keep raising the standards of our behaviour and performance in service of our customers. We do what is right for all of our stakeholders and make decisions that are in the best interests of our organisation, our people and our customers. We encourage enterprise and ambition at all levels. We believe in bringing out the best in everyone through professional development and empowering people to take ownership of their career paths. Our unwavering commitment to upholding the UOB values is reflected in how our colleagues serve our customers and our communities with passion. We are here to make a real difference to shape our future and to add value to the lives we touch. Our leaders act as role models, guiding teams to take on challenges and to take ownership of their actions. Together, we focus on enabling the success and advancement of individuals and teams. Received 10 industry awards across China, Hong Kong, Singapore and Thailand for outstanding human resources and workplace practices. UOB is committed to building a safe, nurturing and inclusive workforce where all colleagues are treated respectfully and professionally and are given equal opportunity based on merit. We promote work-life harmony and a workplace free from discrimination, bullying or harassment. Our expectations of our people and the policies we expect them to abide by are stated in the UOB Code of Conduct. Upon joining, all new colleagues are informed of, and sign up to, their obligations and rights under this code. All existing employees are also required to refresh their knowledge and to renew their commitment to our Code of Conduct through completing an e-learning module every year. We are steadfast in maintaining the trust our stakeholders have placed in us. We do this through our focus on values-led decision making and behaviour, and ensuring a strong risk-focused organisational culture. Our comprehensive framework of policies, processes, methodologies and tools help us identify, measure, monitor and manage material risks and opportunities faced by the Group. Where applicable, employees’ key performance indicators also include risk control metrics. Ongoing training is an essential part of our efforts to ensure a risk-focused organisation. The topics for our training courses include anti-money laundering, countering the financing of terrorism, assessing and addressing operational and security risks, business ethics, core ethics for financial advisers, Fair Dealing ethics, global fraud prevention, financial crime prevention, IT security and cyber risk awareness, regulations on short-selling, and the UK Bribery Act. Several of our training programmes are also available online. This provides our colleagues more flexibility to learn and to complete the courses. In 2017, each colleague across the Group spent an average of 13.3 hours on training related to risk management. Our colleagues also participated in conferences, seminars and workshops to learn more about risk management industry trends and best practices. Some of the events included the Financial Crime Seminar by The Association of Banks in Singapore and the ASEAN Regulatory Summit by Thomson Reuters. We value feedback from our people on our workplace culture and on how well we are upholding our values. In 2017, we invited all colleagues to participate in an online employee survey. Close to 70 per cent of our people completed the survey and their input will help to shape our people-focused programmes. We also ensure our people have the ability to raise matters of potential concern in a secure manner without fear of adverse consequences through our whistleblowing policy. All reported cases are swiftly investigated and resolved. The status of all whistleblowing cases is tracked by Group Audit and reported to the Audit Committee every quarter. We draw upon the diverse strengths, experiences and capabilities of our colleagues from 38 nationalities and different age groups. This helps to enrich our knowledge and appreciation of each other and the markets in which we operate. It also enables us to be sensitive to the needs of our customers and to serve them more effectively. Women accounted for 61.9 per cent of our permanent employees as at the end of 2017 and 57.9 per cent of all the hires in 2017. 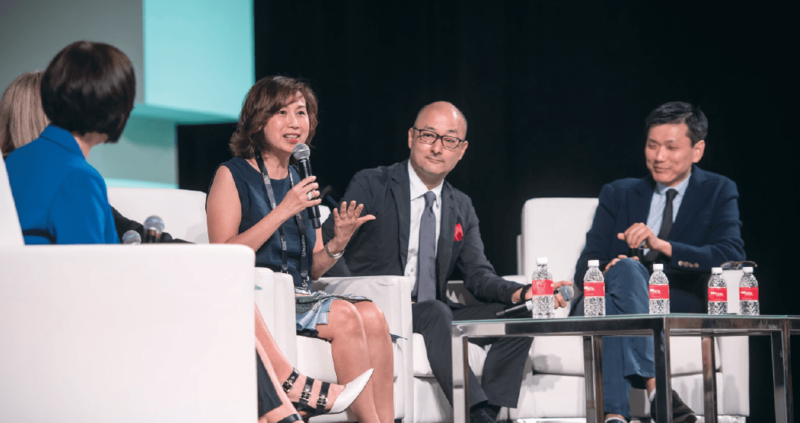 Ms Susan Hwee, our Head of Group Technology and Operations, speaking at the Singapore FinTech Festival in November 2017. Women form 40 per cent of our department heads. Women held 36.4 per cent and 51.6 per cent of senior and middle management roles respectively. They also accounted for 40 per cent of department heads, who are Senior Management reporting directly to the Group CEO or a Country CEO. Recognising the depth of knowledge and experience that older colleagues bring to the workplace, we enable them to continue working beyond the statutory retirement age. In Singapore, we offered re-employment opportunities to 147 colleagues who were eligible for retirement, 74 of whom were women. Our diverse workforce extends beyond a mix of age and gender. The UOB Scan Hub – our nerve centre for checking, digitising and archiving of customer documents – employs people with autism or with hearing impairment, for their special abilities such as a sharp eye for detail, high levels of concentration and the ability to work methodically. These are specific skills which are very suitable for some of the functions at the UOB Scan Hub. In 2017, we increased by 30 per cent to 23, the number of our UOB Scan Hub colleagues with special needs. We continue to partner the Autism Resource Centre and the SPD in Singapore on a structured training programme for people with special needs to work at UOB Scan Hub and to ensure the work processes and the office environment are suited for their needs. We are committed to supporting internationally-accepted human rights principles, including those relating to non-discrimination, child labour, forced labour and freedom of association and collective bargaining. We respect our employees’ lawful right to freedom of association and collective bargaining. Our approach is to maintain mutually trusted and respectful relations with employee unions. We hold regular meetings with union representatives to understand and to address their concerns and expectations. In Singapore, we engage three unions, namely The Singapore Bank Officers’ Association, Singapore Bank Employees’ Union and the Singapore Manual and Mercantile Workers Union. We engage four unions in Malaysia and one in Indonesia. The collective bargaining agreements we have with the unions cover wages and working conditions such as working hours, retirement age and re-employment, shift work, allowances, transport reimbursement, leave benefits, medical benefits, insurance benefits and grievance procedures. As at the end of 2017, the proportion of unionised to non-unionised employees in Singapore, Malaysia and Indonesia was 33.4 per cent, 87.4 per cent and 29.2 per cent respectively. Creating a healthy, safe and harmonious workplace is important to us and we have established a Group-wide workplace safety policy and guidelines to identify and to address health and safety risks. In Singapore, UOB is certified as BizSAFE Level 2 by the Workplace Safety and Health (WSH) Council. Our WSH Workgroup plans and implements various health and safety initiatives. The workgroup includes representatives from different business units and functions. Each department has its nominated WSH leaders, assistant leaders, managers and assistant managers and we aim to take the necessary measures to eliminate health and safety risks. The representatives attend the risk management course approved by Singapore’s Ministry of Manpower. With people critical to the success of our long-term business strategy, in 2017 we launched UOB+you, an integrated approach to attracting, to engaging and to retaining the best talent. Our distinctive employee value proposition is built upon our values of being Honourable, Enterprising, United and Committed. UOB+you captures the essence of UOB’s employment experience and is supported by a wide range of programmes that cover flexible work arrangements, health and wellness, employee welfare benefits, training and development courses and recognition programmes. Our first batch of financial advisers in Malaysia to undergo the UOB-ABS Wealth Advisory Certification Programme. This is one of our many training and development programmes. Setting rewarding career paths, offering educational opportunities and coaching are essential components of our approach to creating a dynamic and engaged workforce. We run numerous training and development programmes to equip our colleagues with the right skillsets to serve our customers and to realise our own full potential. In 2017, we invested $21.3 million in training our people across the Group. Our people completed an average of 43 training hours per person in 2017, which equates to about 1,090,000 hours Group-wide, an increase of 19.7 per cent over 2016. Participants at the 2017 UOB Leadership Academy with our senior leaders. Leadership development continues to be a key focus for UOB. As part of our continual efforts to build our bench strength, the Human Resources Committee manages the Group Organisation and People Review (OPR) programme to identify and to plan effectively for talent development at middle and senior management levels. Individual Development Plans are created for each of our identified talents and are updated on an annual basis. In 2017, we moved the OPR process online to enable the Committee and business leaders to plan and to track development activities more efficiently. Succession planning is an integral part of our OPR and we have succession plans in place for key positions across the Group. Successors to critical roles are provided opportunities in various working committees across the Group to broaden their exposure and learning. The Board of Directors regularly reviews our succession plans through the Nominating Committee. The segment and function heads have the responsibility for their respective talent pools. The Human Resources Committee manages the Group’s collective talent pool. Our new Leadership Right By You initiative is a suite of four development programmes to equip newly-promoted or hired leaders with the required skills based on our UOB Leadership SEED (Strategise, Engage, Execute, Develop) Competency Model. Almost 300 managers completed the programme as at the end of 2017. Eighty-eight new First Line Managers from various functions across the Bank at the launch of the Leadership Right By You initiative in 2017. Our UOB Thailand colleagues at their Leadership Right by You training session. The 32 Management Associates chosen from almost 22,000 applicants, with our senior leaders at the 2017 induction ceremony. Strengthening the coaching capabilities of our leadership team was also a focus of 2017 and as such we launched the inaugural International Corporate Coaching programme for Executive Directors and Managing Directors. Twelve leaders have completed the certificate programme, of which four have gone on to complete the prestigious Worldwide Association of Business Coaches’ Registered Corporate Coach certification. Our increasingly-popular 18-month UOB Management Associate programme aims to attract high-calibre, early-career talents from across the region to take on roles in UOB. In 2017, we received almost 22,000 applications for our programme from which 32 fresh graduates from top universities in China, Hong Kong, Indonesia, Malaysia, Singapore and Thailand were selected for this programme. The number of applications was an increase of 16 per cent over 2016. Selected Management Associates are given overseas assignments to gain regional experience. Since the programme started in 2004, we have hired 529 Management Associates and nearly half of them are still with the UOB Group, with many having progressed well in their careers. As we anticipate the needs of a new generation of increasingly tech-savvy customers, we have also sharpened our digital skills training programmes. The launch of our PCP in Singapore was attended by Ms Indranee Rajah, Senior Minister of State for Law and Finance, and Mrs Josephine Teo, Minister in the Prime Minister’s Office and Second Minister for Home Affairs and Manpower, and our senior leaders. Our people at a design thinking workshop as part of the PCP. 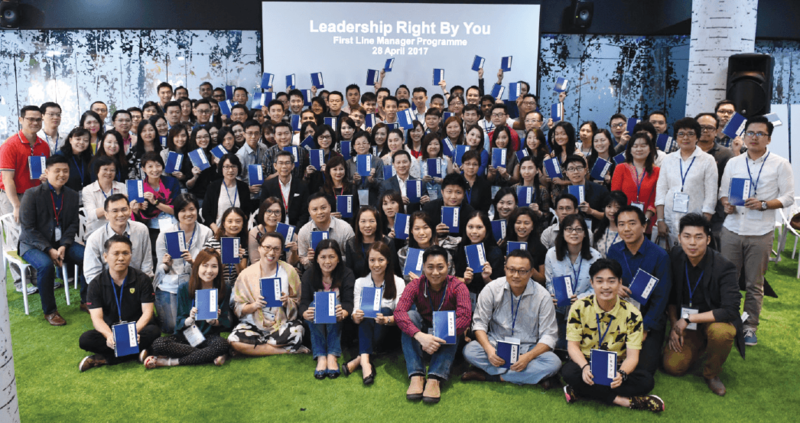 In 2017, we launched a Professional Conversion Programme (PCP) for our employees in Singapore to strengthen their digital capabilities and to prepare them for future roles in the financial sector. The PCP, developed in collaboration with Workforce Singapore, the Monetary Authority of Singapore and The Institute of Banking and Finance, adds to our existing training programmes that prepare our people for the future. In the first phase of the PCP, our customer-facing colleagues, from service associates to assistant branch managers, underwent a series of training programmes covering areas such as design thinking, customer journey design, channel management, and scenario analysis and planning. Each course, ranging from three to 12 months, was conducted through classroom learning, workshops and on-the-job training. About 900 branch colleagues will undergo the PCP over the next two years. As an organisation focused on keeping the customer at the centre of all that we do, we have been upgrading the design thinking and human-centred design skills of our people. About 1,200 employees from various functions have attended design thinking workshops to equip them with the skills to develop creative solutions that meet and exceed business and customer needs. Our HR colleagues attending a design thinking workshop as part of the UOB HR Academy. 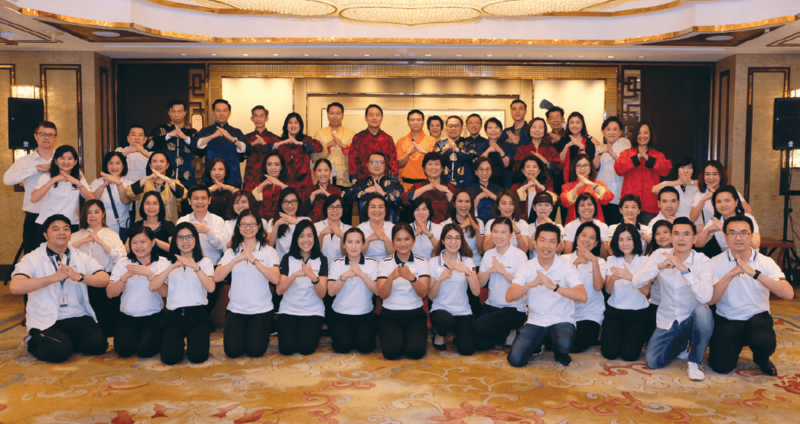 We continued our UOB SUMMIT (Social, Unity, Motivation, Mastery, Innovation, Technology) programme in Singapore to offer more opportunities for employees to update and to upgrade their skills to be future-ready. Under the initiative, we re-invest the grants received under the Singapore Government’s Wage Credit Scheme into career and personal development courses for our people. Colleagues can also use the training credits for courses under the national SkillsFuture programme. A total of 3,078 colleagues attended 492 programmes under UOB Summit in 2017. 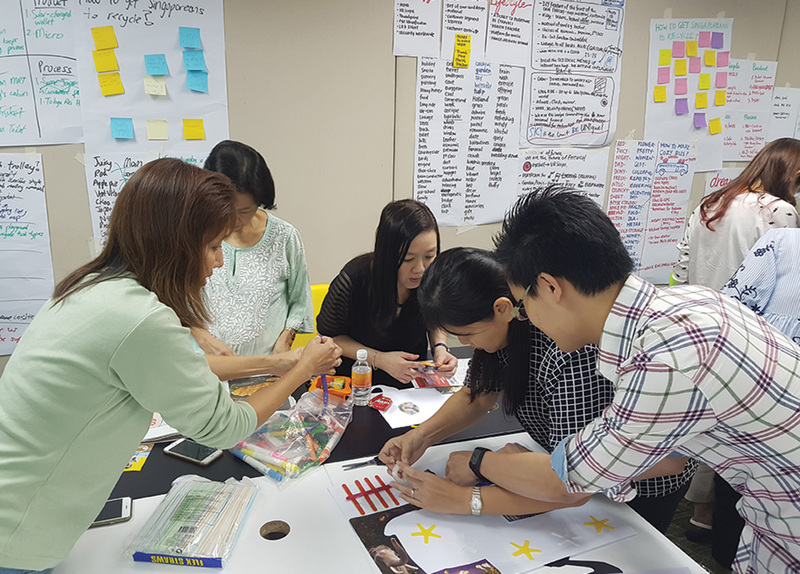 In 2017, we upgraded the skills of our Human Resources (HR) team through design thinking workshops as well as the creation of the UOB HR Academy to strengthen our HR capabilities. We also piloted an HR Analytics Workshop for our HR business partners to help them to be more adept at using data and drawing insights from it in order to make fact-based workforce decisions. UOB is committed to fostering a meritocratic, performance excellence culture in the workplace. Our integrated performance management framework, which comprises four stages namely Plan, Engage, Appraise and Keep Track (PEAK), is designed to assess and to reward performance in an objective and fair manner and to support career development. Using the PEAK framework, colleagues establish their business and personal development goals at the start of the year in consultation with their managers. Performance Improvement Plans are also developed for the weaker performers. Managers are encouraged to hold discussions with their team members throughout the year to review their progress and to address their challenges. At the end of the year, all eligible permanent employees are assessed through performance appraisals against agreed key performance indicators and job-related competencies. The performance assessment structure also includes a values component to reinforce the importance of upholding our UOB values. In caring for the well-being of our colleagues, we offer a range of benefits to encourage eligible permanent employees to achieve better work-life harmony. These benefits include annual leave, parental leave, staff loans, special allowances and reimbursements, healthcare, social security equivalent contributions, life insurance and accident insurance. In 2017, we introduced new flexible work options to help our colleagues balance their work and personal commitments. These programmes have been launched in China, Hong Kong, Indonesia, Malaysia, Singapore and Thailand, and will be implemented in phases across the rest of the Group during 2018. Work from home option of up to 10 days a year to help employees manage their personal needs while fulfilling work responsibilities. Based on a survey of employees in Singapore conducted in 2017. 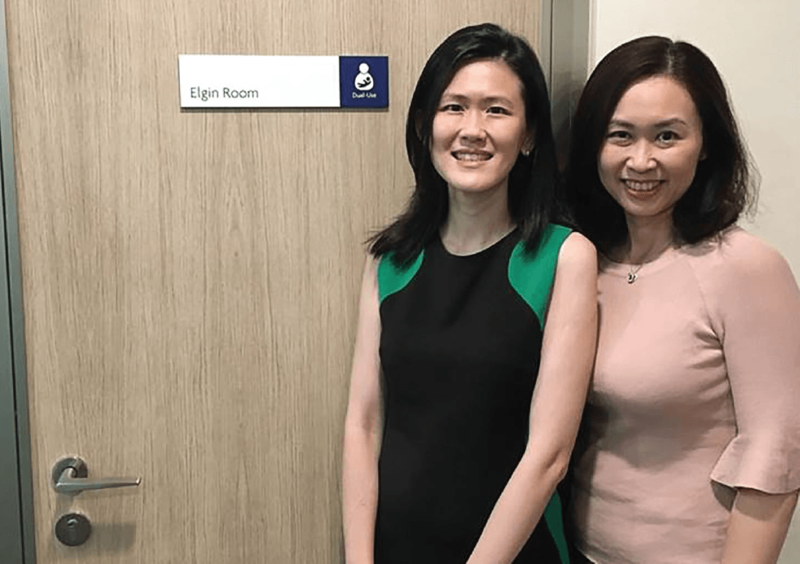 In 2017, we introduced dual-use nursing rooms at various office locations in Singapore to support return-to-work mothers. The dual-use places serve as a practical way to maximise the use of limited office space while catering to the mothers’ need for privacy and convenience. In 2017, we doubled the paternity leave days we offer fathers in Singapore. This is in addition to the shared parental leave we already offer, which allows fathers to share one week of leave with their wife’s maternity leave entitlement. In 2017, the number of our male colleagues who utilised their paternity leave was 137. About 80 per cent of the female colleagues remained in employment for at least 12 months after they returned from their maternity leave. Our colleagues Ms Brittany Cheng and Ms June Loh are appreciative of the privacy and thoughtful convenience the nursing rooms provide. We provide appropriate health and wellness programmes for colleagues across all markets. 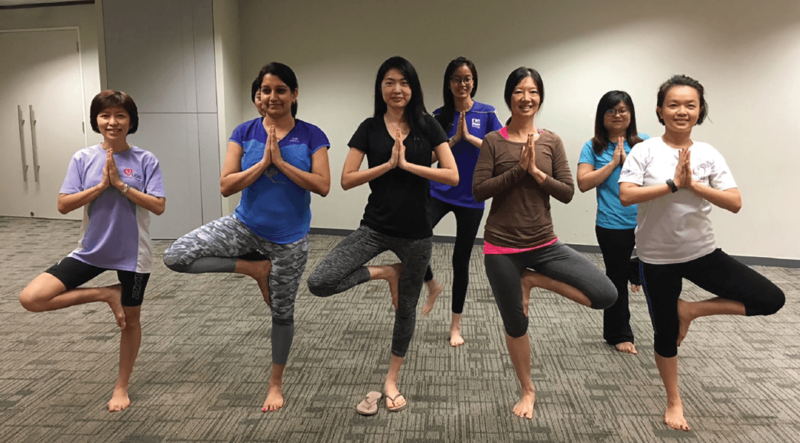 In Singapore and China, our staff healthcare programme – Healthy Employees, Active Lifestyles (HEAL) – offers comprehensive medical and healthcare coverage, as well as flexible wellness benefits for all full-time permanent employees in Singapore and China. $15.5 million worth of HEAL benefits and we reimbursed $48.5 million worth of HEAL benefits since the launch of the programme in 2013. In 2017, we launched a mobile app in Singapore to make it even easier for our employees to submit their HEAL dollar claims. Under the HEAL programme is CARE, an integrated wellness programme that gives our people greater choice and flexibility through a range of healthcare prevention, protection, wellness and treatment options. In 2017, we enhanced the CARE programme to include claims for eldercare and childcare expenses using HEAL dollars. To help our people to stretch their HEAL dollars, we have partnered NTUC Health in Singapore to offer our people and their immediate family members various nursing home services, including home care, at preferential rates. As part of UOB+you, we have partnered wellness companies to conduct health talks, yoga classes and mass fitness workouts since October 2017. The activities are held at our office premises, such as the mass fitness workouts at the UOB Plaza Atrium every Thursday evening. We also encourage our people to participate in and to form sports groups such as badminton, bowling, dragon boat racing, netball and softball. Besides improving the health and well-being of our people, these sessions also help to build a greater sense of belonging among our employees. Fitness classes such as Zumba and yoga are conducted after office hours and during lunchtime. 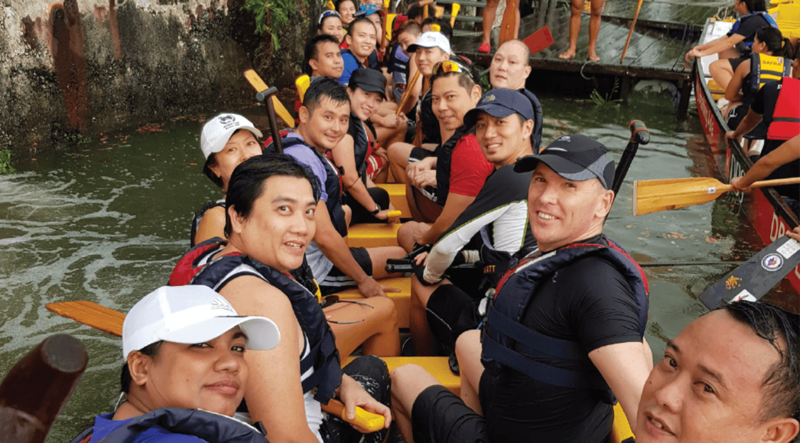 Our dragon boat team comprises colleagues from many departments and offices. 870 colleagues have joined the sessions, including the Group CEO and several members of our Senior Management team. As a values-based organisation where Honour, Enterprise, Unity and Commitment guide our daily working lives, we take time to recognise those colleagues who best demonstrate living our values. We conduct two Group-wide recognition programmes annually – the UOB Honours and the UOB Customer Commitments Awards (CCA) – whose winners inspire us to greater heights. We launched the UOB Honours programme in 2017 to recognise teams across functions and geographies who collaborated to deliver innovative solutions, who increased productivity or who demonstrated long-term commitment to the Bank. 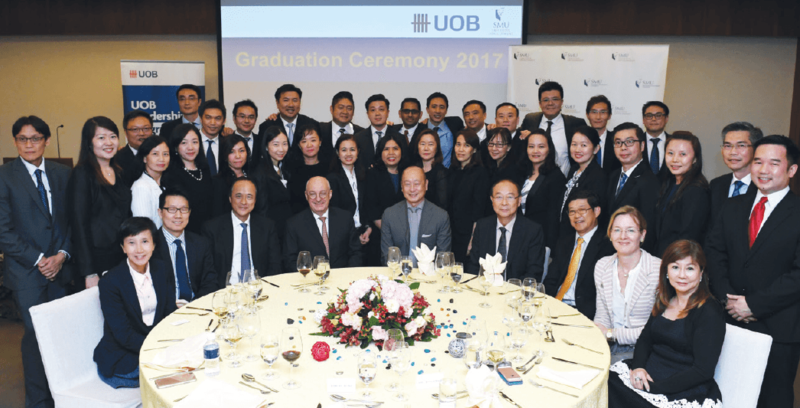 The first UOB Honours awards ceremony recognised 15 teams across the Group and celebrated 170 long-serving colleagues in Singapore and more than 700 colleagues in other markets through the Dedication Awards. During the event held in Singapore, we recognised the significant contributions of Mr Francis Lee, Head of Group Retail, through our first UOB Lifetime Achievement Award. Mr Lee joined the Bank in 1980. Among his many achievements was spearheading the Bank’s expansion in the region between 2003 and 2008 which resulted in our acquisitions in Indonesia and Thailand. In 2017, we ran the second UOB CCA programme across the Group. The UOB CCA campaign, competition and ceremony seek to encourage and to inspire our people to act always in the best interests of our customers. At the UOB CCA ceremony, we recognised 85 individual colleagues and 28 teams for being role models who have best demonstrated our customer commitments in their daily decisions and actions. They were selected from more than 3,750 entries and the winners included colleagues from China, Hong Kong, Indonesia, London, Malaysia, Mumbai, New York, Seoul, Singapore, Thailand and Yangon. The winners of the UOB Customer Commitments Awards (CCA) Individual Top Awards. In demonstrating our commitment to diversity, we partnered the Embassy of the Kingdom of the Netherlands and organised a “Women in FinTech” networking and panel discussion at the Singapore FinTech Festival 2017. The session enabled 20 women leaders from the finance industry, FinTech start-ups and government agencies to connect with one another and to share their thoughts on diversity in the workplace. Panel speakers shared their experience in being a female leader in their company and industry. One of the winning teams at our inaugural UOB Honours awards ceremony. Queen Maxima of the Netherlands and a UOB senior leader sharing their thoughts on diversity with participants at the networking session. In Thailand, we supported a project by the Thai Bankers’ Association, Social Innovation Foundation and the Thai Red Cross to provide employment opportunities at non-profit organisations for people with disabilities. Through our support, 38 people were contracted for administrative work and general services at the Thai Red Cross and local government hospitals. We also engaged five people with disabilities to help us with our employee engagement activities such as blood donation drives and Happy Friday under our UOB+you programme.